This complete course 16 hour course covers changes made to Chapters 2-9 of the 2017 NEC. We’ll start with the first half of Chapter 2: Wiring and Protection, with Articles 200-230, and topics such as branch circuits and feeders. This section will conclude with a 10 question incremental quiz. To wrap up chapter 2, we’ll cover Articles 240-250, including such topics as overcurrent protection and grounding and bonding. This section will conclude with a 10 question incremental quiz. The next we’ll start Chapter 3: Wiring Methods and Materials, with subject such as general requirements for wiring methods and materials, and cabinets, cutout boxes, and meter socket enclosures. This section will conclude with a 7 question incremental quiz. In this next section we’ll conclude chapter 3 with different types of cables, and liquidtight flexible metal conduit and electrical metallic tubing. This section will conclude with a 8 question incremental quiz. Next we’ll tackle the first half of Chapter 4: Equipment for General Use, with Articles 400-411. The topics include switches, receptacles, cord connectors, and attachment plugs, and switchboards, switchgear, and panelboards. This section will conclude with a 14 question incremental quiz. We’ll finish chapter 4 in this section, covering Articles 422-480. This includes the following topics, appliances, fixed electric space-heating equipment, and fixed outdoor electric deicing and snow-melting equipment, among others. This section will conclude with a 16 question incremental quiz. For the next section we’ll look at the first half of Chapter 5: Special Occupancies, and Articles 500-516, including hazardous locations, commercial garages, and motor fuel dispensing facilities. This section will conclude with a 10 question incremental quiz. We’ll continue in chapter 5 with Articles 517-551, including topics such as health care facilities, carnivals, circuses, fairs, and similar events, and recreational vehicles. This section will conclude with a 10 question quiz. In the next section we’ll finish chapter 5 with Articles 555-590, and topics such as marinas, boatyards, and commercial and noncommercial docking facilities, and temporary installations. This section will conclude with a 10 question incremental exam. We’ll move onto Chapter 6: Special Equipment with a look at the updates in Articles 600-645, and topics such as, electric signs and outline lighting, cranes and hoists, and elevators, dumbwaiters, escalators, moving walks, platform lifts, and stairway chairlifts, as well as PV systems. This section will conclude with an 11 question incremental quiz. In the next section we’ll look at the first half of Chapter 7: Special Conditions, Articles 700-712, with changes in emergency systems and energy storage systems. This section will conclude with an 11 incremental question quiz. For the second half of chapter 7, we’ll take a look at Articles 725-770, Class 1-3 remote-control, signaling, and power-limited circuits and fire alarm systems.This section will conclude with a 9 question incremental quiz. In the next section we will cover Chapter 8: Communication Systems, and Chapter 9: Tables. We’ll look at grounding of radio and tv equipment and updates to notes to tables. This section will conclude with a 3 question incremental quiz. Lastly we’ll cover the updates to the Informative Annexes, including continuous load calculations, information that electricians are likely to use on a regular basis. This section will conclude with a 2 question incremental quiz. I feel every year I will be using AYOP until I retire this course is that good. The only suggestion I would make is to consider significantly improving the quality of the example graphics. Many are clumsily made and of low-fidelity that aren't rendering well even on close-up. Time required to complete the course is very close to what was advertised (16 hours). I really liked the flexibility of start and stop option of course. I could do it easily from my phone in my free time. Enjoyed the on-line course. It was nice to break it up over a couple of weeks, with a few hours each night. 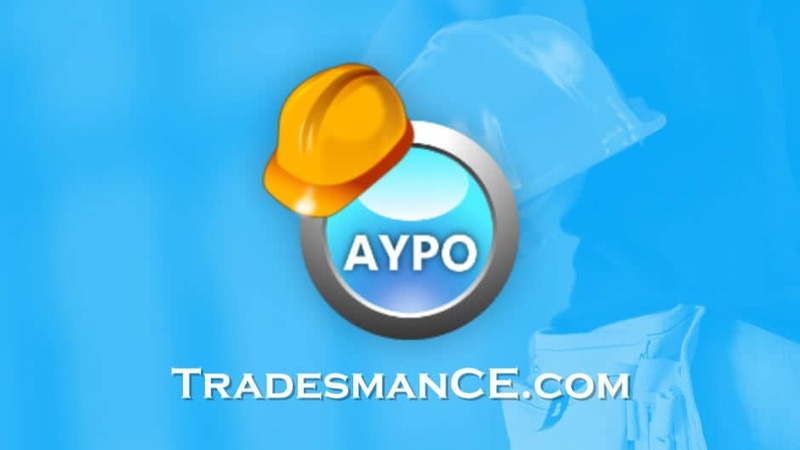 Choose AYPO for all your CE needs. I actually paid for another course provider and it did not hold my attention. After reviewing your site and information, I decided to purchase your program. I found it interesting, well laid out and enjoyable. I felt this was lot easier having the new code book as a study tool as I went last time I did do it and passed but having code book to follow along works better for me. Not bad. Better than the 2-day course I've been taking. I like working from home. I would like to thank Junior for all his help. This course is very well done. The explanations are very helpful. I have been taking "in class" continuing education for my entire career. I have had my license for forty years. This course provided me with more information on and reason for the changes than any previous course. Informative, items were discussed that I have not been exposed to. I thought the course was very educational. I enjoyed your continued education courses and learned a lot. Your course did exactly what CEUs is designed to do get me in the code book and refresh and learn changes I need to know. Very Good. This online course is probably more effective than an classroom setting. Although the classroom offers interactive Q & A. The course felt like it was longer than 16hrs, if you read all of the material. The courses were good and thorough online. I liked this more than sitting in a classroom listening to an instructor, it made me pay attention due to the quiz at the end of each lesson. I especially liked the information from the CMP's. I've never seen or heard of that before. Hard more than 16 hours into it. Quizes where pretty hard. As a PLT it would be nice if there was more emphasis on Chapter 8. Works great with my schedule. Instructor simplifies material making it very easy to understand and apply. This was the easiest to use and follow in line course I've used. The support staff is wonderful also. I learned a lot from this course. Well organized and straight to the point. Some inconsistencies from the training material to the actual Questions from that lesson were noticed. Overall decent course. There were a few technical errors, those little things that drive people like me nuts. One that I recall is referring to the NEC as instructions. The course is fine. The review is more difficult than the course because of the confusing rating system. I had to give all threes because i can't tell if a (5)1 or a (1)5 is better. Made you work for it and had to pay attention, way better the spending two days in a class. Enjoyed it on my schedule and learned information that I probably would haven’t retained in a classroom! Some of the wording for the quiz questions were confusing. My "Maintenance Electricians License" does not allow for me to perform the work Of Journeymen & Master Electricians. Most of everything in the course was slightly over my head. Bur I "did" learn from this and i'm walking away knowing more than I did before I started the course!!!! Courses that contain riddle and tricky questions are a useless waist of time. This course had just that. Info that didn’t do a normal sane person any good. In addition the quiz had us popping back in forth in the code book. Someone wasn’t organized when laying out the content. Lastly this course was more expensive than others out there. Content is excellent. The course took 3 times longer than the 16 hours required. After all this is supposed to be a "review" of the code changes and the number or complexity of test questions is unnecessary. You should use the video to present the code information instead of having a guy reading an outline. I have been a master electrician for 35 years, I do not take these course to be asked questions that are obscure. Some of the answers came from your notes maybe not directly from the code one of the answers to a question appeared to be a typo the code says divide your direction is to multiply one code question on the very last quiz says the answer is "permitted" the code says corrected not sure where that came from I misread questions because I don't take enough time to read want to get done one question about the electrical datum on a pier said the outlets had to be outside that were GFCI protected the code says every outlet inside and out has to be GFCI protected got that one wrong if you want me to be persuaded that you care about this make your course a bit interactive so questions that come in can be addressed which might lead to oversights or errors being corrected. The quizzes were too difficult. There is no reason to play with the wording of the questions. Maybe make a low voltage license specific course? I aiready have a license and i felt this to be more of a course designed to get me ready to take a license test. too many questions on 'Attemp Test"
Worse online course I have done. for just a 16 hour review with quizzes and everything I think I have 40 hours into it. It was frankly ridiculous for a review. Unfortunately I will drive 1.5 hours to hall for continuing Ed in the future. I would not recommend this class.